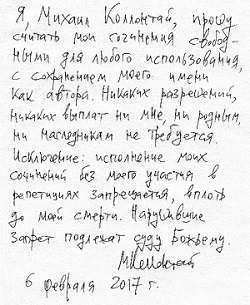 You have reached the site which contains a storage of data concerning creative activity of composer (and pianist) Mikhail Kollontay (other spellings: Michael; Kollontai, Kollontaj; 柯隆泰). This musician was formerly known as M. Ermolaev (Yermolayev). If you read Russian, please note that russian pages of this site currently contain much more information. Authors apologize to the reader for possible errors in English, since English is not their native language. Feb 2019: Full score/orchestral parts improvements: Kerygma. The Hell, op. 25b-2. Feb 2019: Full score/orchestral parts of the First Piano Concerto improved. Audio recordings of this Concerto uploaded. 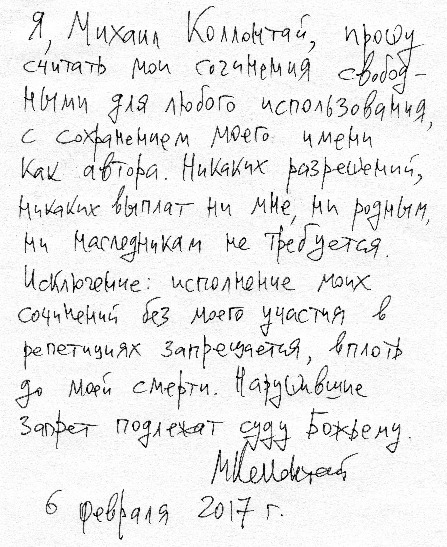 Feb 2019: Drawings by M. Kollontay’s father, Georgy Kollontay, uploaded to a separate cloud storage folder. Published for the first time. Aug 2018: New compositions: Fifth Symphony op. 64 (2017-18) and Three Easy Counterpoints op. 65a (2018); score is available. Apr 2018: Renewed score uploaded: Three songs op. 49 (1993, 2018). Mar 2018: A new composition: Moments Musicaux for p-no op. 63 (2015-18); score is available. as they carry my name on it. my family or my estate. is not satisfied, then it will be left to God’s judgment.